I am so blessed to have met the appealing character of Peony in Pearl S. Buck’s novel about Jews in China. It seems that as early as the 8th century Jewish traders settled in China and their tribe increased through the centuries. Buck thoroughly researched their history and includes many authentic details in this story that tells about their community in the city of K’aifeng in the northern province of Honan. She gives a short intro and timeline of the Jewish presence in China in a preface, and my Kindle edition includes an afterword by Wendy R. Abraham with a thorough history up to about 1990. The story is told from the point of view of the Chinese bondmaid Peony, who belongs to a Jewish household and for her own survival uses all her resources to promote this abandonment of her owners’ practice of their Jewish lifestyle. She and the Young Master of the household grew up as playmates and good friends, and now that they have come of age she works to turn his heart away from the faith that has been passed down from his parents. That may sound bad, but she is honestly playing her part in this drama in which each one tries to follow the most prudent path he can, while at the same time honoring his elders. From the distance of time or in a novel we can see a broad view, but when you are thrust into a role with no script, you can only do your best. The name of the temple is factual, and if the confusing statement about The Way comes from Pearl Buck’s imagination, it is probably based on the truth of what it is like to try to live out a faith tradition that is more history than reality. This experience is certainly not foreign to many moderns. I don’t know when I last read such a wonderful work of fiction. It was a page-turner because I could not at all imagine how the plot would flow. The setting in China was the primary strange aspect for me; I don’t think I’ve read any of Buck’s other works set in that country and I’ve been fairly incurious about Asia generally. But recent exposure to the writings of Lin Yutang has made the history and culture of China seem much more accessible and intriguing, and prepared me to enter into this tale. 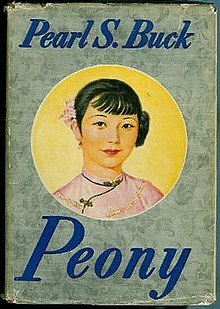 Peony is a young Chinese girl whose depiction I fully trust, because Pearl S. Buck grew up in China as the daughter of Presbyterian missionaries and was immersed in that world. She returned as an adult and wrote many books about China and its people, including the most famous one, The Good Earth. Lin Yutang himself was a friend of hers and they seem to have encouraged each other in their writing. Her love for the family increases as the years go by, even as they come to depend on her in countless ways. That’s o.k., because she always tries to make things work out for their health and welfare. Her own happiness must be found in the context of disappointment, and in relationship with people who take her for granted. Was life sad or happy? She did not mean her life or any one life, but life itself— was it sad or happy? If she but had the answer to that first question, Peony thought, then she would have her guide. If life could and should be happy, if to be alive itself was good, then why should she not try for everything that could be hers? But if, when all was won, life itself was sad, then she must content herself with what she had. Getting to know Peony and watching how she matures over the years was pure pleasure. She has good sense and character even as a teenager, and as she responds to the sometimes cataclysmic changes in the household her competence and wisdom grow, often through struggling to overcome her own desires and heartache. Through her we get an idea of how the Jewish religious practices might have appeared to the Chinese, and she also epitomizes many of the best qualities of the Chinese and their outlook on life that I was only recently reading about in Lin Yutang’s books. His mother, Leah, Peony, Kueilan, these four women who had somehow between them shaped his life were shaping him still. He longed to be free of them all, and yet he knew that no man is ever free of the women who have made him what he is. He sighed and tossed and wished for the day when he could return to the shops and the men there who had nothing to do with his heart and his soul. Peony knew his thoughts. Nevertheless, she asked, “Why do you sigh, Master?” “Because I do not know what is right,” Ezra replied. She laughed softly at this. “You are always talking of right and wrong,” she said. Now she was pressing the soles of his feet. They were hard and broad, but supple. She went on in her cheerful way. “Yet what is right except that which makes happiness and what is wrong except that which makes sorrow?” “You speak so because you are not confused between Heaven and earth,” he said. “I know I belong to earth,” she said simply. My gleanings include rubbish and pies. I guess I’ve had enough time and thinking power this week to read and ponder, but my activities didn’t result in anything of my own to posit or report, so I’ll just pass on some recent gleanings. Women Priests? I love it when a reviewer is bold enough to say “This book is rubbish.” Honesty and confidence! Although, if that’s all she can say, she won’t get a hearing; I want to hear reasons for her belief. I just read this blog post titled “Merlin Stone’s book is rubbish”, and though I had never heard the author’s name before I immediately wanted to read that article. It’s a brief review of When God Was a Woman, which the blogger first had to read in seminary years ago. She writes, “There is neither historical nor anthropological support for her thesis that the Hebrews suppressed goddess worship. She tries to prove that the Canaanites had a matriarchial and matrilineal structure. She is wrong on both counts.” Go to the blog Just Genesis to read the supporting details. The writer always has lots of fascinating historical and archeological knowledge to pass on. Pies, pies, pies... Three women collaborated on a book, which as soon as I read about it I had to have sent as a birthday gift for my granddaughter. It may be a bit early for her, but I like to encourage little girls to start taking a creative role in the kitchen and to look to real grownups for inspiration. The book is Pieography, written by Jo Packham, Food Styling by Anne Marie Klaske, Photography by Traci Thorson. 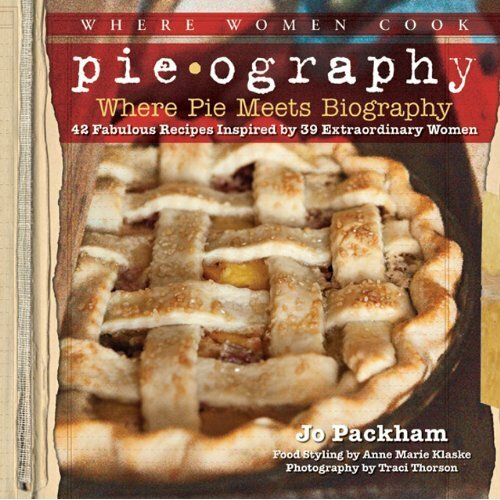 All of these women have blogs; Jo and Traci feature photos of some pies, but I think you have to get the book if you want the recipes and stories. I haven’t seen the book yet, but I’ve enjoyed Anne Marie’s blog in particular. The clean and elegant style is nice to surf around in and see snippets of the Klaske Family’s farm life. On Thursdays you can get inspired to bake pies! Death of the Old Man: Father Stephen Freeman shared a link to his daughter’s blog, on St. John of the Cross and the loss of identity, or the Dark Night of the Soul, or the “death of the old man.” Actually the subtitle of the post is “The Loss and Discovery of our Identity in God” (italics mine), so it ends on a very positive note, to be sure. The book is divided into four chapters. Chapter 1 deals with the “hostility theory” which holds that the early Christians were hostile toward images. Chapter 2 deals with early Jewish attitudes toward images. Chapter 3 deals with the early Christian attitudes towards images, that is, the pre-Constantinian period. Chapter 4 deals with Eusebius of Caesarea who witnessed the beginning of Constantinian era. The author is an Orthodox priest, and the blogger Robert Arakaki was Reformed in his theology before converting to Orthodoxy. I’m looking forward to reading all the reviews of what looks to be a thorough treatment of the subject. Beethoven in Space: Lastly, here’s a music video featuring Hubble images and beautiful music. A blessed weekend to you all! May the pots never grow cold. About 30 years ago we owned a modular house whose many large windows were covered by the original fancy draperies, so that when the curtains were closed they covered most of the expanse of three walls with nubby gold curves. 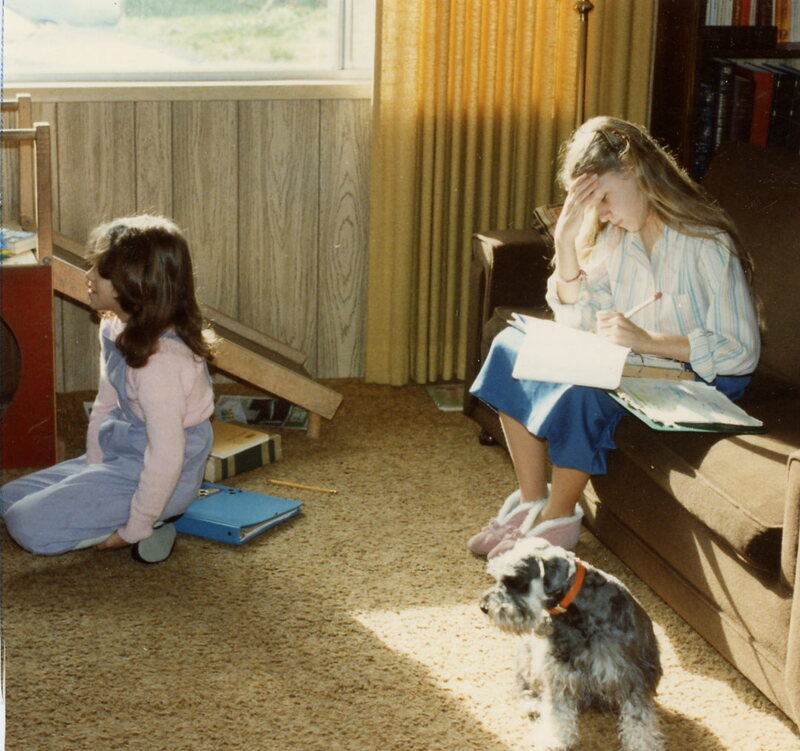 The walls were thin particle board painted to look like wood, as you can see in the photo – but I didn’t mind those as much as the drapes. 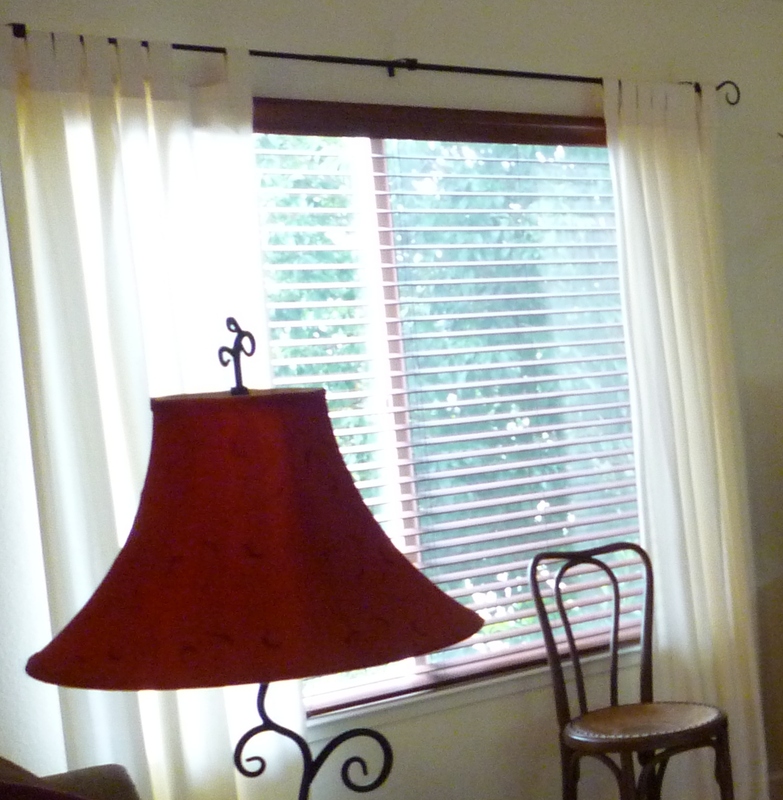 I would have preferred something more rustic and casual and of another color to go with the country setting, but even if we’d had the money we couldn’t have justified spending it to replace Perfectly Good high-quality drapes. What is your purpose in life? To love God and be useful to Him. What is the most important way for you to do that? To love people. My house is dark and my pots are cold. These are just signs to the poet that there is no woman at home to welcome him. The verse reminds me of advice I read to housewives who haven’t figured out what to make for dinner, but who want to do something to give their husbands a good feeling when they come in the door after work: While you are getting your act together put an onion in the oven to bake so that he will get a hopeful olfactory signal. A message I get here: A woman conveys her love and hospitality by these simple modifications to the environment: opening the drapes or turning on the lights, cooking something in the kitchen, and in both ways warming up the sensory atmosphere. If she has a kiss and a smile for her family and guests all the better. The last few years when my husband and I live here alone, I notice that I am the one who thinks about light control. In that photo above you can see all the light that came into the humble house with the gold drapes. It was the best feature of the house, as I was later to discover, when I wanted our new house to have as much light — it was not to be. The photo was likely taken in the winter, when we would open the drapes wide and let in all the warming sun. In our area we can get along pretty well in summertime without air conditioning, if we manage the windows and window coverings: At night open all the windows to let the cool air in; in the morning close everything up to shut out the sun’s rays, and leave them that way (and the house kind of dark!) until the air inside gets as warm as outdoors — then you may as well get any breeze that might stir, and be ready for the coolness to enter as soon as it arrives. In Spring or Fall our present house doesn’t get very hot, so in the mornings I like to open the blinds and let the sun in as soon as I come downstairs — but my man never thinks of doing this. For my mind, sunlight is the very loveliest decoration. And at night, I like to close the curtains or blinds so as to feel sheltered against the world. This also seems to be, in my experience, a homemaker’s impulse. I have learned to do many artful things in my houses over the decades; I have arranged and painted furniture, swept the floor, bought bedspreads and embroidered Bible verses to hang on walls that I painted, but those things aren’t more important than the light-monitoring I do. I also tend the fire in the stove, and light candles, and keep the pots warm. Let’s be cheerful! We have no more right to steal the brightness out of the day for our own family than we have to steal the purse of a stranger. Let us be as careful that our homes are furnished with pleasant & happy thoughts as we are that the rugs are the right color and texture and the furniture comfortable and beautiful. Thank God for making Edith Schaeffer the kind of woman who could pass on to us a bright homemaking heritage.